“Birds of Paradise” was composed in 2015 at the request of Tromba Mundi. Founded in 2007 for the sole purpose of the exploration, promotion and performance of new works for trumpet ensemble, Tromba Mundi has recorded several world premiere compositions and continues to commission new music for the genre. 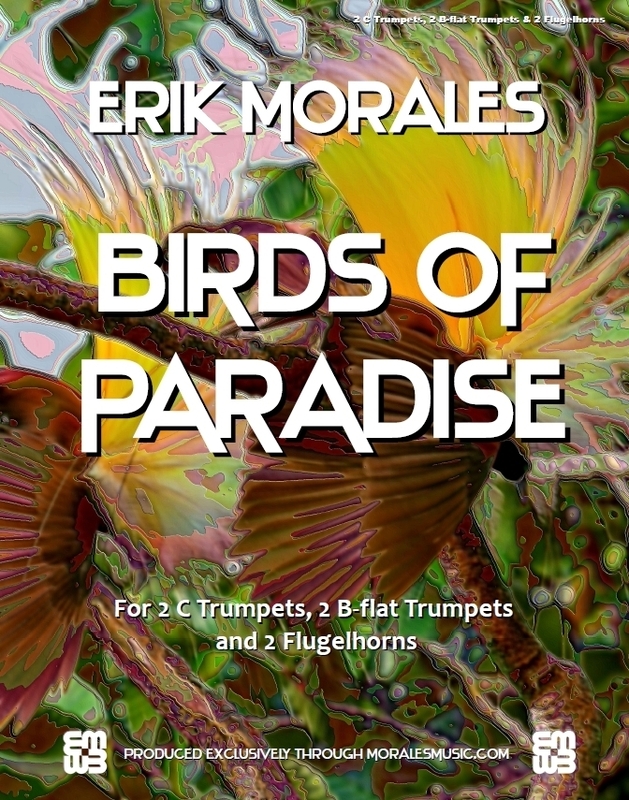 “Birds of Paradise” was conceived as a “triple duet” utilizing 2 C's (1st C Trumpet doubles on B-flat Piccolo Trumpet), 2 B-flats and 2 Flugelhorns. In the beginning of the piece each duet is introduced independently. The focus of the work is the interplay between the three duets. Interplay is also an interesting behavior of the real birds of paradise that inhabit eastern Indonesia, Papua New Guinea and eastern Australia. These special animals are the inspiration for this work. “Birds of Paradise” received its official premier on October 7, 2015 at Carnegie Hall in New York City. The piece was part of Tromba Mudi's “Sinfonia Americana!” program. For more info on Tromba Mundi please visit www.trombamundi.net.